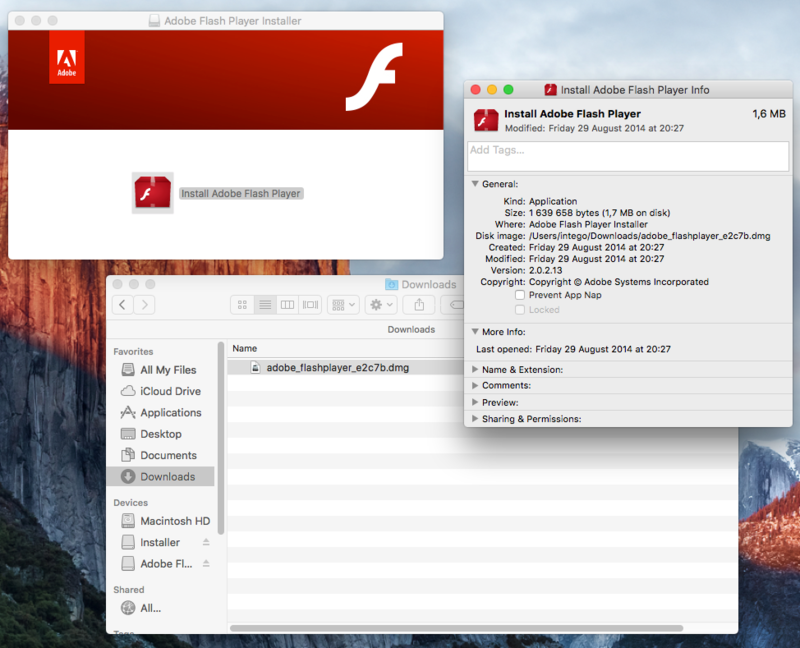 Mac users are once again being urged to exercise caution when installing updates to Adobe Flash Player, after a fake update was discovered infecting computers. 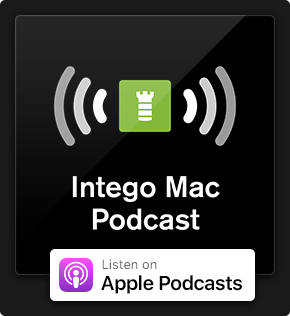 Intego security experts have identified the rogue package installer as a variant of OSX/InstallCore, and have updated Intego VirusBarrier definitions to provide protection. 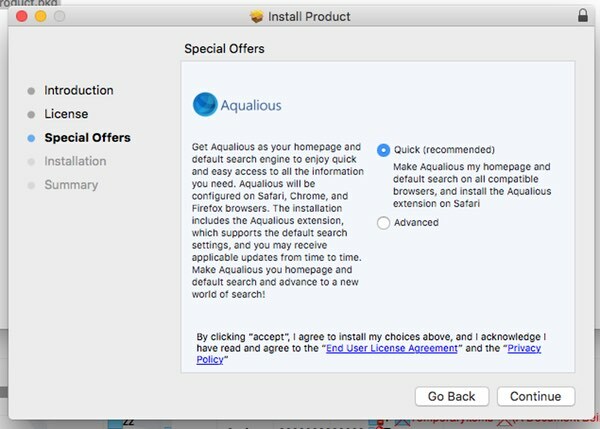 The in-the-wild attack has been spread in the form of a Mac Package installer .pkg file, also known a flat package, and has been signed with a legitimate Developer ID certificate — effectively tricking OS X's built-in Gatekeeper security to believe that the files can be trusted and are not malicious. 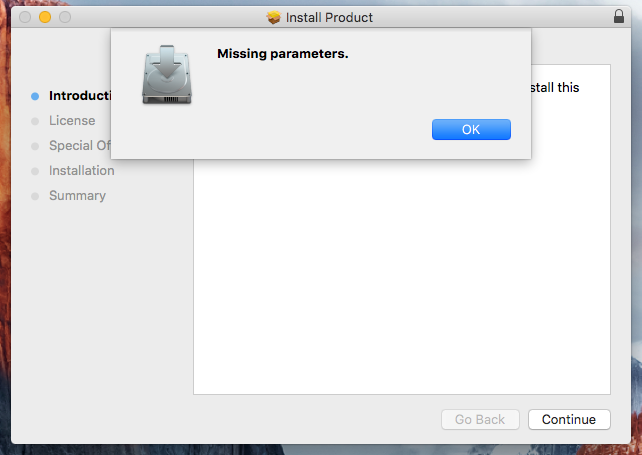 Curiously, if the Mac Package installer, called Product.pkg, is located outside the DMG volume and the DMG volume Installer is unmounted, then you will receive a "Missing parameters" error. However, if the Package installer is located in the DMG volume, then you will be prompted to continue the installation. As a result, victims may find that their OS X computers have had a number of potentially unwanted programs (PUPs) installed on their systems. Intego researchers report that third-party apps they have seen being installed by the fake Adobe Flash update include MegaBackup, ZipCloud, and MacKeeper. Copyright © 2016 ironSource. All rights reserved. Two months ago we described how an earlier version of OSX/InstallCore had been spread after Mac users began to see bogus pop-up warnings about Adobe Flash requiring an update, which resulted in scareware being installed onto their computers. In both this and the previous instance, online criminals signed their malicious code with an Apple developer certificate, allowing the malware to bypass a key part of OS X's built-in defence. In an attempt to prevent malicious code from infecting OS X computers, by default you are only allowed to run programs that have been downloaded from the official App Store or that have come from "identified developers." By using a valid Apple developer certificate, the attackers are tricking OS X into believing that their code can be trusted and allowed to execute — with potentially dangerous consequences. 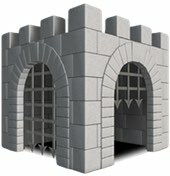 There are a variety of ways to exploit security holes in OS X Gatekeeper to allow malicious code to sneak onto computers, but presently it seems the simplest method of all is to sign your code with a developer's certificate. All of which raises the question — from where are the attackers getting their valid Apple developer certificates? A definite possibility is that some OS X developers are being too careless with their own security, and not recognising the need to properly protect their certificates from hackers. At the time of writing, the compromised Apple developer ID certificate (MDK7FNV856, in the name of one Nikolay Nikolay Lastovka) has not been revoked. 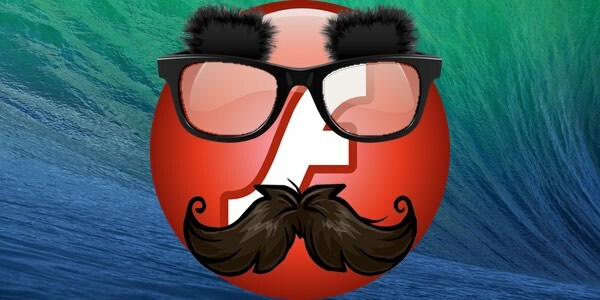 The seemingly never-ending advisories from Adobe about newly-discovered security holes in Flash Player have made critical updates a regular occurrence. There is a certain irony that security professionals have devoted a lot of time in warning the general public about the importance of installing patches and keeping their Flash installations updated, only to see online criminals exploiting the situation by launching their own attacks as warnings that Flash needs to be updated. Is it possible that the security of all OS X users is being put at risk because some developers are blind to the threat of their own Macs being attacked, and are carelessly allowing themselves to be hacked and confidential certificates to be stolen? 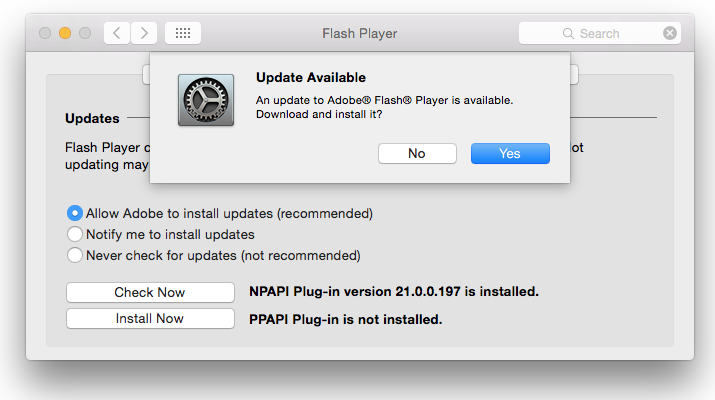 Ultimately the only safe place to get your Adobe Flash Player update is from Adobe itself, and if you are uncertain — read our guide on how to tell if an Adobe Flash update is valid. The best advice for many users may be to ensure that you have configured Adobe Flash Player to automatically update itself — while retaining the option to trigger manual updates if you can't wait for Adobe to get around to updating your system. If you still find the regular appearance of security holes in Adobe Flash disturbing, you may wish to take further action such as uninstalling Adobe Flash completely. 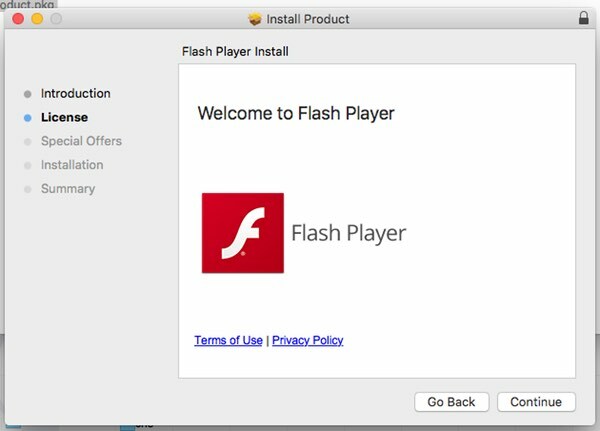 This entry was posted in Malware, Recommended, Security News and tagged Adobe Flash, Fake Flash Player, malware, OSX/InstallCore, PUP/PUA. Bookmark the permalink. …Or even better remove flash player from your system entirely, that way there is no attack surface. One big problem with removing Adobe Flash Player is that many of my legit sites require it to run properly. Some will not run without it. I assume Intego has provided adequate protection for this threat. Hey use network Security. It’s one solution to all the problems. 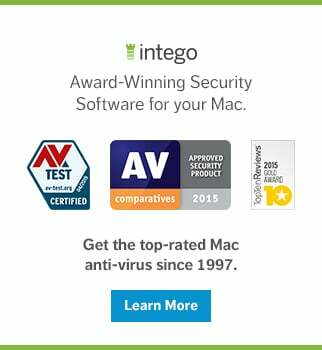 It not only works for your mac, but it also protects all your devices under the same network/wifi. I always install a flash blocker extension no matter the OS or browser.. even on Linux. So this happened to me but I never opened the file that was downloaded to my mac. I did check my security settings, and it allowed applications downloaded from mac store and identified developers, so i guess it recognized it as a identified developer. I moved the file (FlashPlayer.dmg) to the trash and since changed my settings (for now) to only allow application downloads from the app store. Im just curious as to why the virus didn’t automatically open itself and wreak havoc on my computer…it went straight to downloads and I never opened it and simply deleted it. Do viruses like this usually require the user to open the file (thinking its the real adobe flash player) and install it? Ditto to the above – this is exactly what I’ve had download around three times! Not going on that site again. I also deleted it straight away but is that enough? I’d also like to an answer to your question: Do viruses like this usually require the user to open the file (thinking its the real adobe flash player) and install it? I just downloaded the .dmg and opened and was about to “install” when I realized this bunk web address – I put everything in the trash and emptied it, am I in the clear or is there something more I need to do? I actually downloaded the whole thing like an idiot. I was in the middle of going through my bank statements online because I was doing my taxes and was just trying to quickly get it off my screen by updating and moving on to get my stuff done. I had just downloaded my previous tax return with all kinds of sensitive information. Everything I was doing at that moment was sensitive. As soon as my search engine changed and pop ups came up every second, I unplugged my wifi and turned it off on my computer. I tried to delete everything but nothing would delete from the trash can. I ended up deleted iOS from my hard drive and reinstalling. I am terrified, however, that the hacker gained access to my stuff prior to me downloading or even in the few minutes post-download before my computer started wiggling out and I turned my wifi off. Any words of encouragement? where does one find the adobe malware installer application?